Ricotta Crepes with Vanilla Bourbon Strawberries, a boozy twist on brunch. A French-inspired sweet ricotta-stuffed crepe recipe with strawberries cooked in bourbon and vanilla. Decadent and delicious! This recipe was originally posted in May 2018 and the instructions were updated in March 2019.
Who doesn’t love a delicious crepe? Whether it’s smothered in Nutella, sprinkled with powdered sugar, or made savory with cheese and butter, crepes are loved across the world. 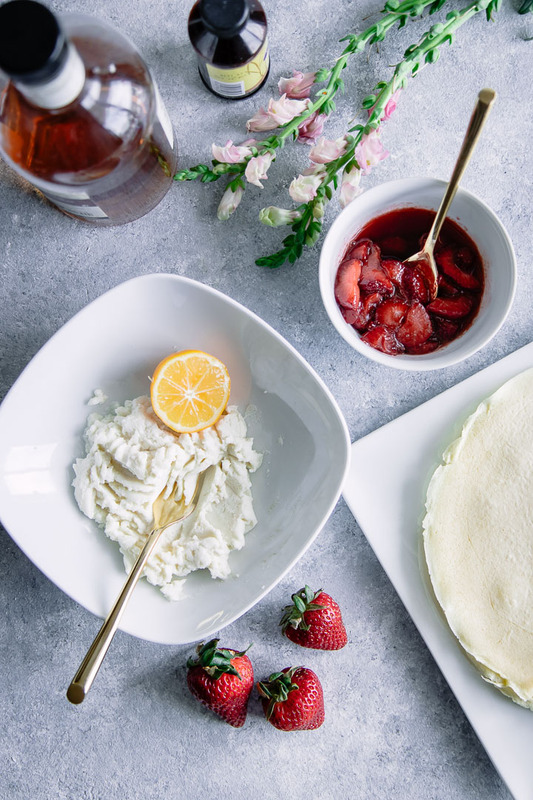 These Ricotta Crepes with Bourbon Vanilla Strawberries are perfect for a low-key weekend brunch or for a more special occasion. The good news is, crepes are about as quick and simple to make as it gets: only 6 base ingredients that you probably already have on hand, and just 20 minutes from prep to plate. Strawberries, vanilla, bourbon, and brown sugar come together to create the perfect sweet and boozy take on this international classic. Ready to indulge in these Ricotta Crepes with Vanilla Bourbon Strawberries? Let’s do it! What are crepes? Where do they come from? Crepes are very thin pancake-like wraps that made with flour, eggs, and milk. 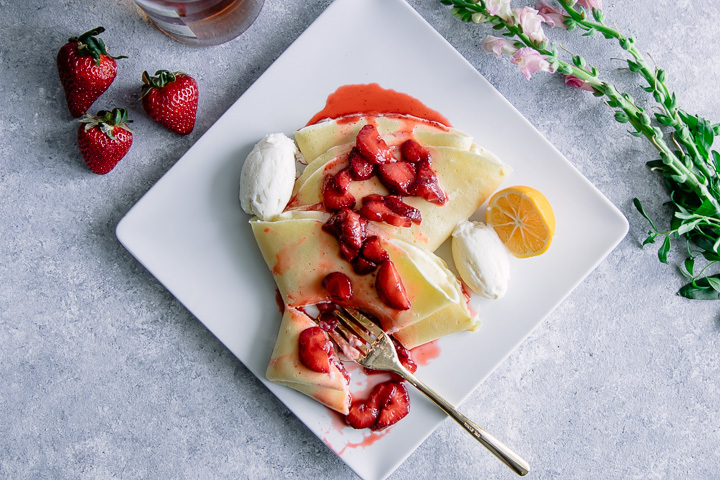 The crepes we know and love today originate from France, but other cultures have similar thin flour cakes, such as blintzes from Eastern Europe, panqueques from Argentina and Uruguay, crepella from Italy, and pannakeke from Sweden. In fact, crepes have infiltrated the world and most cultures have some sort of thin pancake-like dish typical to its cuisine. A delicious brunch doesn’t have to be complicated. These Ricotta Crepes with Bourbon Vanilla Strawberries are simple to prepare and ready to eat in just 20 minutes. First, mix eggs, milk, vanilla, flour, and salt in a large mixing bowl. Next, heat butter or oil in a large round pan on medium heat and pour ⅓ cup of batter onto hot pan. Spread batter until thin and even (picking up the pan and twisting until batter runs to the edges works best if making crepes at home). Cook the crepe batter about 1-2 minutes, or until batter is beginning to dry, then flip and cook another 30 seconds. Remove from heat and set aside to cool, continuing to make crepes until all batter is gone. To make the Bourbon Vanilla Strawberries, add strawberries, vanilla, bourbon, and brown sugar to a small saucepan and heat over medium-low heat for ten minutes, until strawberries begin to soften and the sauce begins to thicken. Put it all together: mix the ricotta, cheese, and vanilla. Spread ¼ cup of cheese mixture to the middle of crepe, then fold or roll crepe on a plate and top with bourbon vanilla strawberry sauce. Crepes are very simple to make and do not require anything more than quality flour, a big mixing bowl, a large pan, and a spatula. Otherwise crepes are a simple, low maintenance recipe! 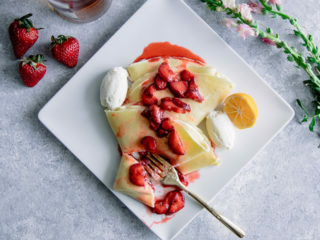 This Ricotta Crepes with Bourbon Vanilla Strawberries recipe is a new Saturday morning indulgence! If you love breakfast and brunch as much as we do, check out our decadent Meyer Lemon Marscarpone Dutch Baby Cake, Pluot Brown Sugar Buckwheat Pancakes, and our fizzy Stawberry Saffron Bellini recipe for your next brunch get together. Did you make this Ricotta Crepes with Vanilla Bourbon Strawberries recipe? 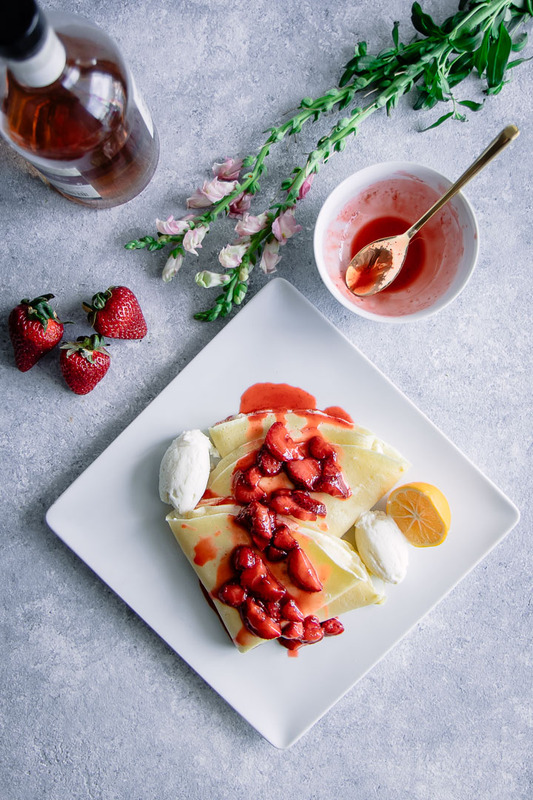 Leave a comment and rating below to share how it turned out, pin it to your favorite breakfast or brunch Pinterest board, and tag Fork in the Road on Instagram so we can see your crepe creations! Crepes: In a large mixing bowl, mix eggs, milk, vanilla, flour, and salt until well blended. Heat butter or oil in a large round pan on medium heat. Pour ⅓ cup of batter onto hot pan and spread batter until very thin and even on pan (picking up the pan and twisting until batter runs to the edges works best if making crepes at home). Cook 1-2 minutes, or until batter is beginning to dry, then flip and cook another 30 seconds. Remove from heat and set aside to cool, continuing to make crepes until all batter is gone. 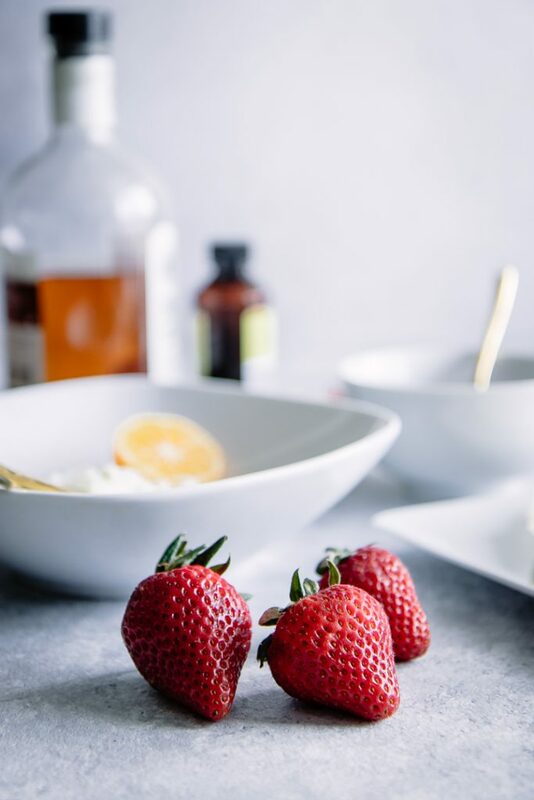 Bourbon Vanilla Strawberries: Add strawberries, vanilla, bourbon, and brown sugar to a small saucepan and heat over medium-low heat for ten minutes, until strawberries begin to soften and the sauce begins to thicken. Remove from heat and serve immediately. Filling and plating: Mix together ricotta cheese and vanilla. Spread ¼ cup of cheese mixture to the middle of crepe, then fold or roll crepe on a plate and top with bourbon vanilla strawberry sauce. Leftovers & Storage: Crepes will last up to four or five days in the refrigerator, but they tend to dry out after one or two days. Reheat in pan or microwave. 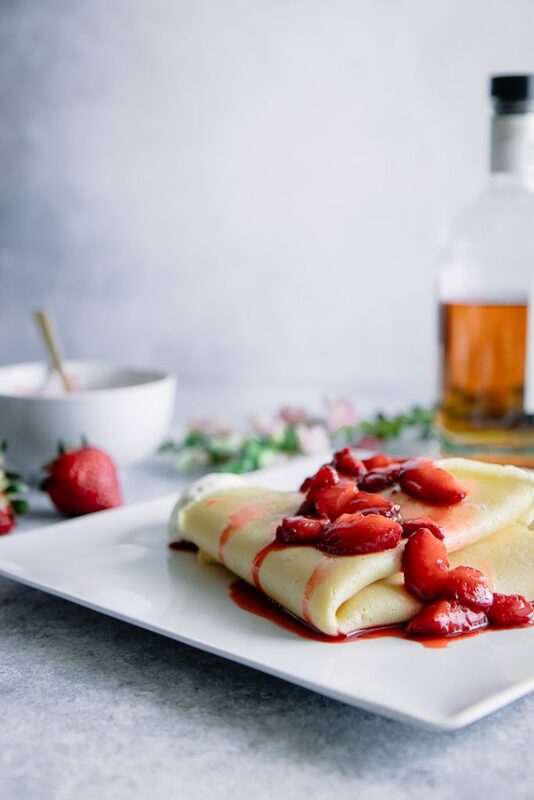 Nutrition: This Ricotta Crepes with Bourbon Vanilla Strawberries recipe is an indulgent meal, but it can easily be made healthier by omitting the added brown sugar and using light ricotta cheese. I just love how versatile crepes can be! This looks perfect for a weekend brunch. Saturday morning brunch kicked up a notch! Looks amazing! You had me at crepes…and then you added bourbon…okay! Oh my goodness, those strawberries! How perfect!! This looks like a great weekend brunch or brinner! Strawberries and liquor- What’s not to love?! Oh, my goodness! These look amazing! I love your story behind these boozy crepes too 🙂 My first memory of eating crepes is at the Westgate Hotel in San Diego when I was a little girl. My parents ordered Crepes Suzette, and I was mesmerized by the fire as they flambeed them at our table. I’m not sure I loved the boozy orange sauce then, but I love it now! I attempted a Crepes Suzette recipe once and almost caught the house on fire, so I went more traditional this time.